Yeah! It's Sunday again. Although the weather was kind of gloomy in the morning with little bit of drizzling now and then, it still did not put off our enthusiasm to today’s SuperSunday event that we have being looking forward too. 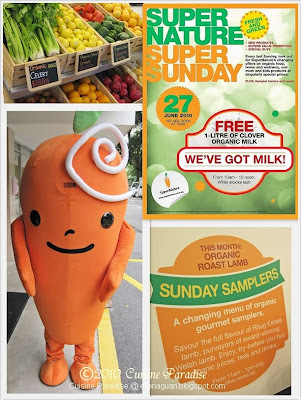 We arrived at the venue around 10.40am after our usual Sunday service, and was surprised to be greeted with a cute “walking carrot” that is so adorable, and as well as irresistible by most of the kids at the event. I was there just in time to caught sight of how the chefs from One-Ninety's restaurant of Four Seasons Hotel serving their “Organic Roast Lamb” which is one of the item available at their Sunday Champagne Brunch. This Rhug Estate's award-winning lamb comes from a 1,050-hectare organic farm in Wales that marries careful husbandry practices with animal welfare, to ensure delicious, healthy and safe meat. The roast lamb was marinated overnight with fresh rosemary herbs, olive oil, garlic and etc. It was roasted for 4 hours in 65°C of heat to keep the fat well distributed within the lamb and to ensure a tender, juicy roast. 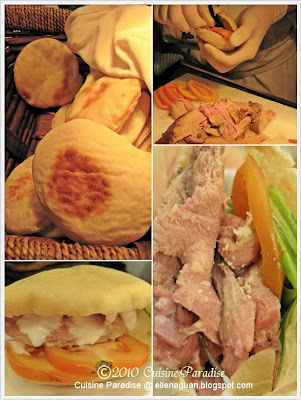 The chefs filled each of the freshly baked pitta bread with some slices of roasted lamb meat, salad green, tomato and sauce that make it into a great snack and finger food. One thing that I would like to mention is, this roast lamb dish has indeed being very well prepared that even my mum whose dislike lamb meat due to it’s strong odor can’t even tell that she is eat lamb meat until I reveal the truth to her. So for those who don’t take lamb meat due to its strong odor, I can assure you this roast lamb is fantastic. If you are interested in roasting some perhaps you can try out the recipe HERE by courtesy of One-Ninety. Other than enjoying the “Organic Roast Lamb, there is also another counter whereby you can sample some organic juices from the fresh fruits & vegetables available in store. Out of the 4 types of juices available, I have tried their “Super Antiox” which is a mixture of Apple, Carrot, Beetroots and Ginger. This is the 1st time I have tired adding “ginger” in fruit juice and I must admit it taste really wonderful, and with each proportion of the items being well mixed together the overall taste is not over power by the strong fragrance/taste from the ginger. Another juice that I have tried their “Kale & Apple”, when I heard the word “kale” I was kind of like errrrrr…… but when I take a sip, I knew I was wrong about my conception. 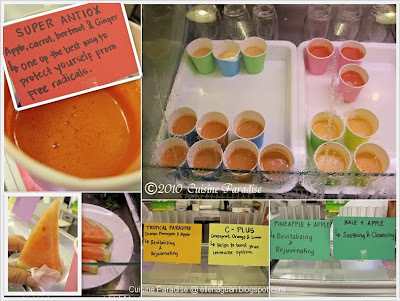 Surprisingly, the fragrance and sweetness of the apple in it has totally covered the vegetable taste and I am sure this will be a great juice for kids who dislike vegetables. 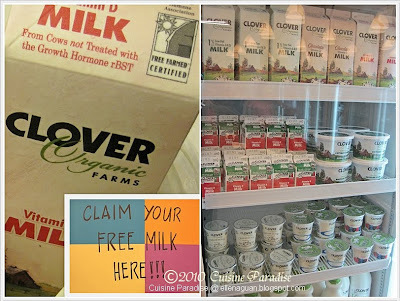 At the same counter where we get to sample the fruit juices, they also give out free milk to visitor whereby you can get a FREE pack of 1 litre pack Clover Organic Fresh Milk while stock last. 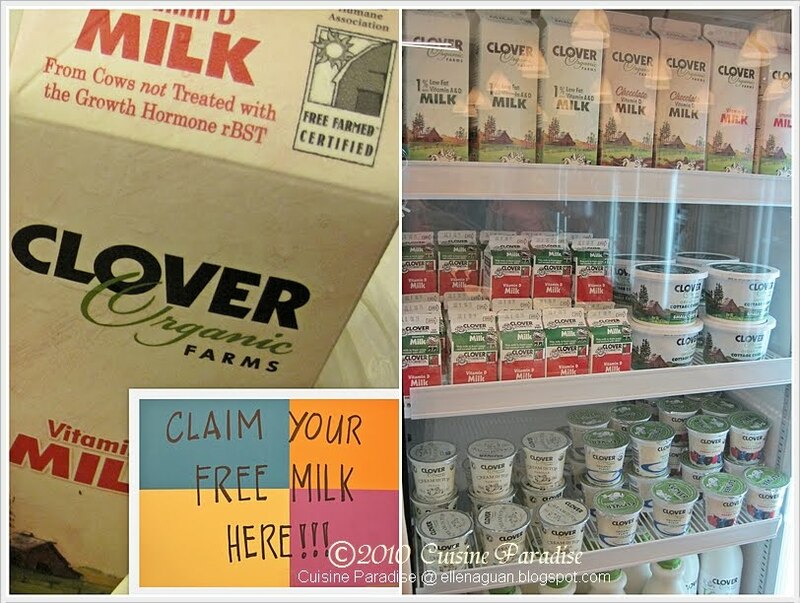 In store, they also sell a few Clover products such as Organic Cream, Cottage Cheese and Yoghurt, which you might like to check them out too. These are some of the Organic vegetable from Australia and Taiwan. Mum was surprised to find her favourite “White Bitter Gourd” that is imported from Taiwan. She has loved this “White Bitter Gourd” juice a lot during our recent trip to Taiwan and now she has found it here which cost about S$6.00 for 300g size. And from the photo, you can also notice that the Organic Fresh Lily Bulbs are different from the China type which is available in our local supermarket. 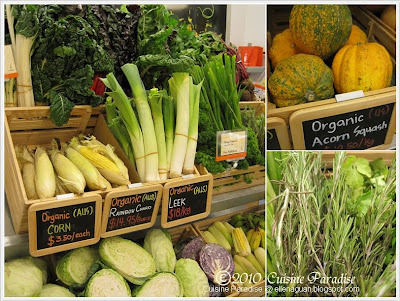 There are a lot of fresh fruits, vegetables and herbs available for your pick and if you are lucky, you can also find some interested items that you might not find in the local supermarket too. As you can see, the organic rosemary shown in the above photo at the bottom right corner rather different from the common one that we have in the local supermarket as well. By the look of it, do you know what is this? I was kind of puzzle when I first look at it because it seems to be like “Burdock - 牛蒡” that is commonly found in supermarket or wet market. But the colour and outer texture seems rather different. So after some clarification from the store assistance, they confirmed that these are organic Burdock from Taiwan. 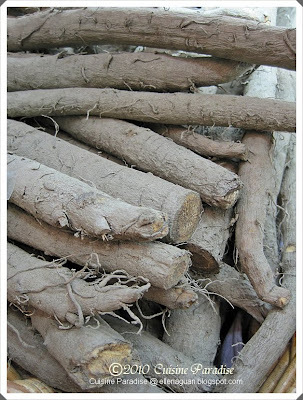 Burdock has been used for centuries as a blood purifier clearing the bloodstream of some toxins as well as helping the body to get rid of excess water by increasing urine output. It is also a topical remedy for skin problems such as acne, eczema, rosacea and psoriasis. Chocolate! I believed most of us love to have a piece or two of this to cheer up our day. No matter which type of chocolate that ranges from Dark to Milk to Nuts I am sure there is one that captures your taste buds. At the SuperSunday event, I saw this very attractive Organic Dark 70% praline filled mini chocolate eggs from Green & Black that reminds me of the past Easter Sunday treat. 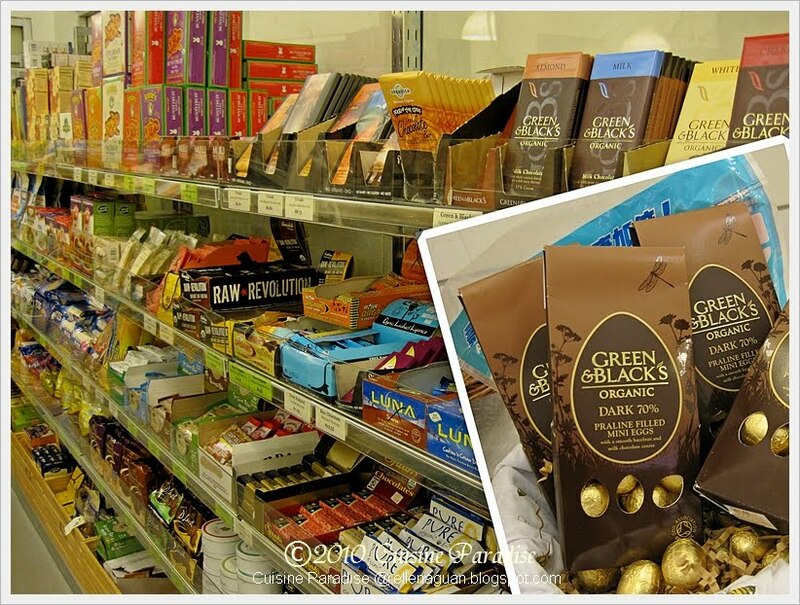 And apart from the mini eggs there are also a lot of different varieties of chocolate bars and snacks that are available in the store too. 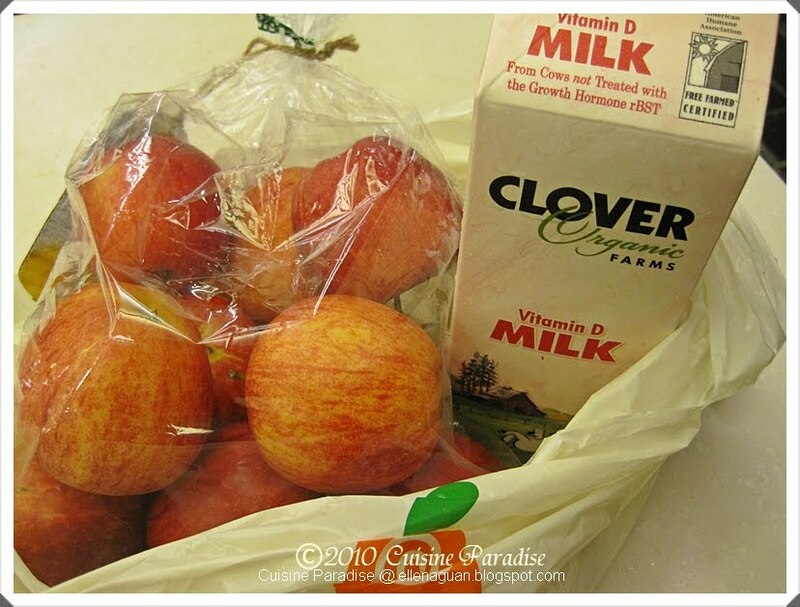 Thanks Patricia from Club21 for the goodies bag that consists of a bag of Organic Red Apple and a pack of Clover Fresh Milk. Do give their fresh fruit a try, you will find that it really taste different from the normal one that we get from the supermarket. It is definitely much more sweeter and tastier. 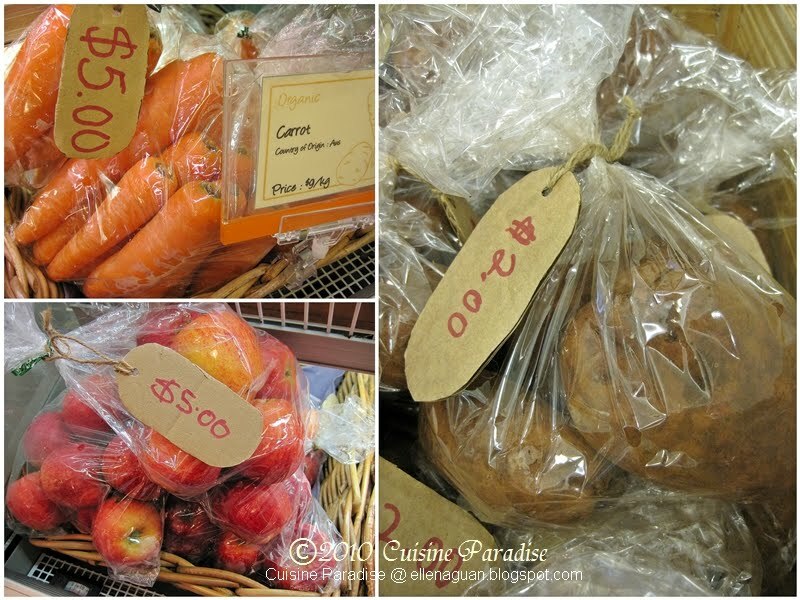 Furthermore during the event, customers are able to pick up some discount items such as Potatoes for S$2.00/kg pack or a bag of 10 Apples for S$5.00 which usual price is at S$16.00 a pack. So do stay till for the next Super Sunday event on 25 July 2010 for more discount items available. Em... talk about Fish & Co, most of us will relate it with their signature Fish & Chip or Seafood Platter that comes with seasonal fish, calamari, prawn and mussels in creamy garlic and butter sauce that served together with rice & chips. Other than the wide varieties of items in their menu, have you ever thought of having some light savory/sweet tea-time treat at Fish & Co during afternoon shopping/leisure break? If having something light with a cup of coffee/tea together with friends while catching up some latest update with each other, then this Tea-Time Set at Fish & Co might be something that interests you. Remember my food tasting post at “Sweet Spring - 糖水春” recently, I was also invited for one of their “Sweet & Savory Tea Time Sets” tasting as well. In their savory menu, you can choose any set out of the 4 sets together with a beverage of your of your choice for just S$7.90++. For today’s food tasting, we will be having “Fried Calamari, Prawn Trellis, Mesclun & Chips” and “Mini Pizza & Mesclun”. 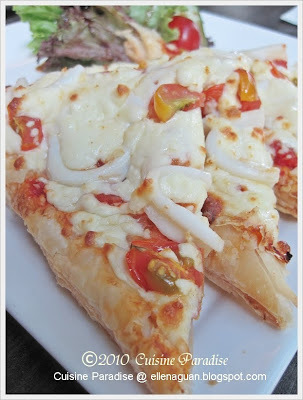 For their Pizza base, it is not those usual pizza dough base but instead they used something flaky like puff pastry dough. This gives it a special texture to go with the tomato sauce and calamari topping. Great to be served as finger food during chatting session. From the Beverage menu, you can choose either:- Coke, Sprite, Ice Tea, Coffee, Kola Tonic and Passion Fruit. 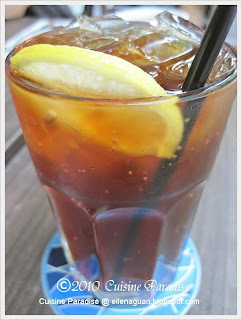 For me I always like to have a cup of Ice Tea or Coffee for my afternoon Tea-Break whereby the Ice Tea will give me a refreshing taste whereas coffee will keep me awake for the rest of the day. 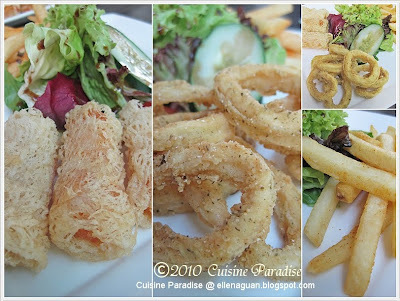 “Fried Calamari, Prawn Trellis, Mesclun & Chips” is another set of finger food where you to enjoy your some deep-fried snacks with chips and green salad. The calamari is nicely fried till crispy and tender which is neither chewy or tough. I love the Prawn Trellis that is quite similar to deep-fried Vietnamese nested spring roll. This set will be great for those who love Prawn & Calamari. After the “Savory Treat”, here comes our “Sweet Treat”. Fish & Co “Sweet Tea-time Set” comes with a choice of your beverage and you can choose either “Hot Fudge Chocolate Cake” or any flavour of your choice of cake from their “US Cakes” menu for S$6.99++. 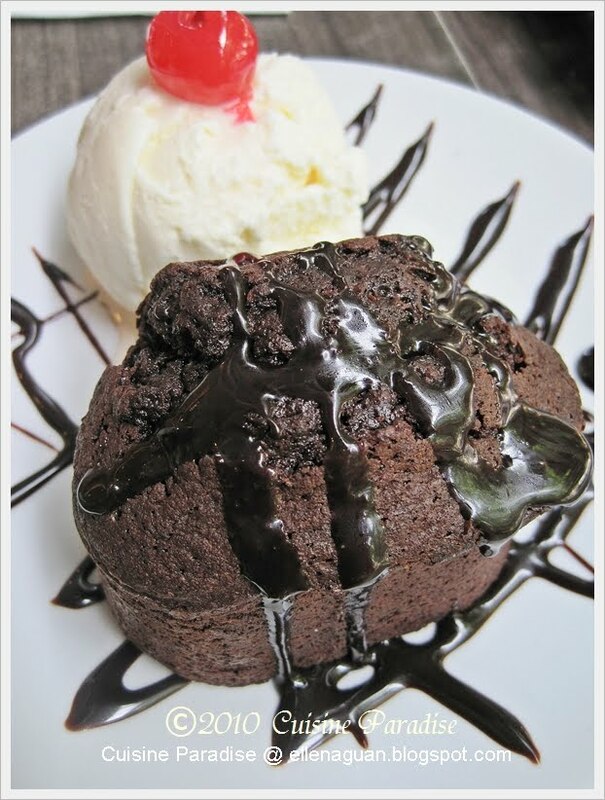 I love their “Hot Fudge Chocolate Cake” which is very soft and moist inside and it goes pretty well with the ice-cream. And when u cut open the chocolate cake, you will still see some “chocolate lava” oozing out. The photo shown above is the "Caramel Fudge Colossal" where they used graham crackers as the based of the cake. 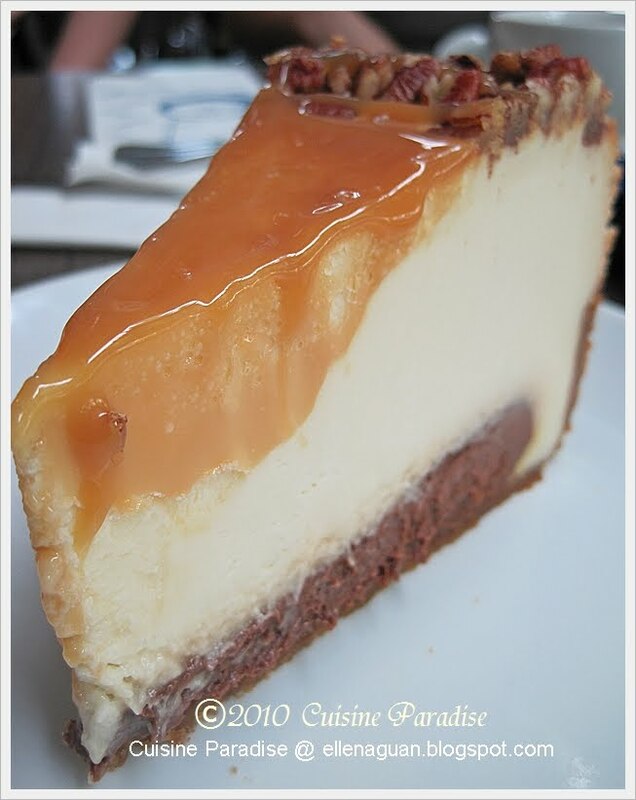 It is then topped with a thick layer of rich chocolate fudge filling followed by creamy new york cheesecake and finished with golden caramel and loaded with pecan pieces. 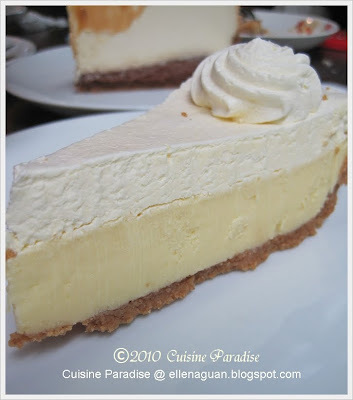 Although most of the ladies or non-cheesecake lover will avoid this choice but I can assure you that, this is indeed a very rich and delicious cheesecake to go with a cup of black coffee or tea to pamper yourself for an good afternoon tea-break. Key Lime Cake is very refreshing tart custard resting on graham crust and topped with lime juice-laced whipped cream. Each bite will be leaving you with some citric taste that is suitable for those who prefer slightly sour dessert instead of sweet treat. For me, this might not be towards my liking because I am a sweet tooth person and sour food/drink/snacks are always a “NO” on my list. But for those who loves lemon, orange or lime this must be your choice of cake to order. This Savory & Sweet Tea Time Sets are availabe from 3:00pm - 6:00pm at all the 16 Fish & Co Outlets in Singapore. Lastly thanks Sharon & Julynn from Fish & Co for inviting me on this food tasting session. For starter, let's have a cup of Berry Smoothie to cool down from the summer heat. Smoothie is a blended beverage made from fresh fruit (fruit smoothie) or vegetables. In addition to fruit, some smoothies might include crushed ice, frozen fruit, honey, yogurt or fresh milk. This "Berry Smoothie" here is pretty easy to whip up, what you require are:- fruit blender, some strawberries, honey(optional) and fresh milk. 1. Rinse and trim the strawberries, cut it into halves then blend it together with fresh milk and honey till smooth and creamy. 2. 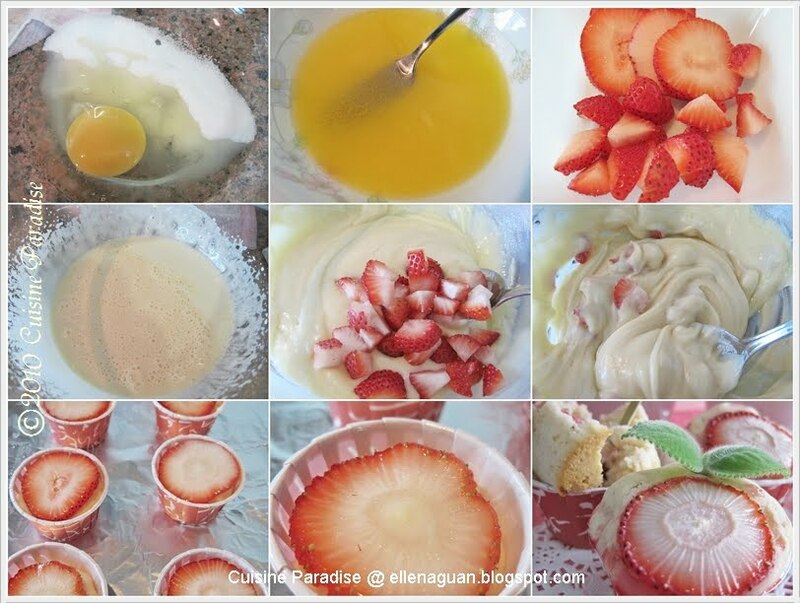 Transfer it to serving cups and top with extra strawberry slices as garnish. 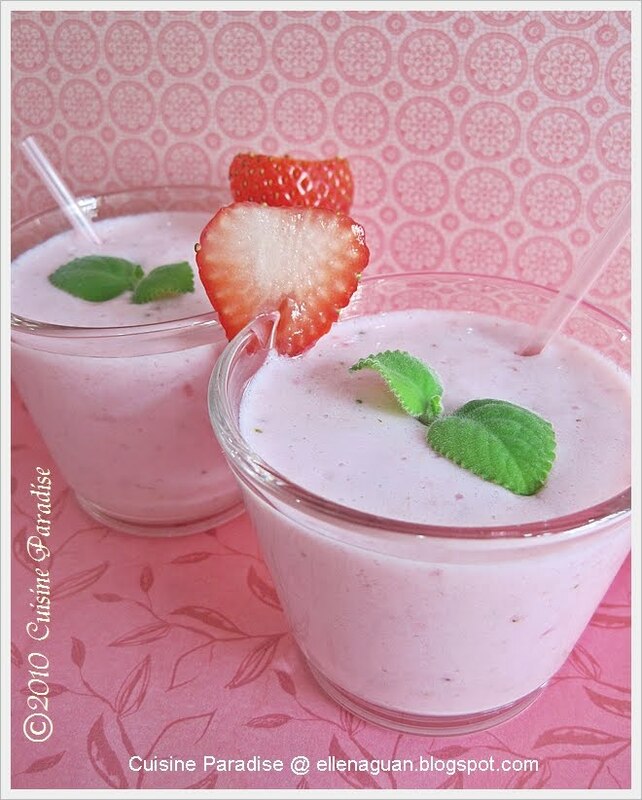 ~ You can use mixture of strawberry & plain milk or either one type for this smoothie. 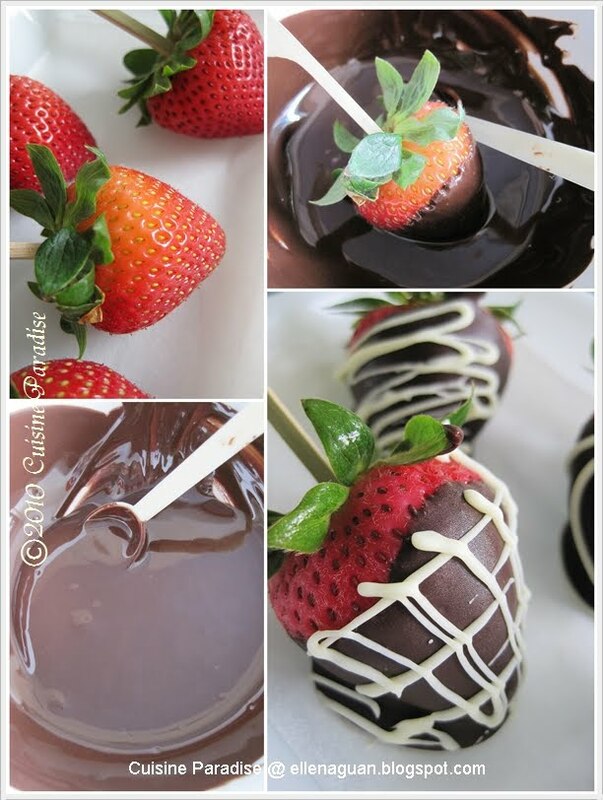 Chocolate usually goes pretty well with strawberry as it perfect it with an extraordinary flavour. It is not difficult to make this beautiful treats, but you may take a bit of practice on how to dip and yet not drop the strawberries in the melted chocolate. 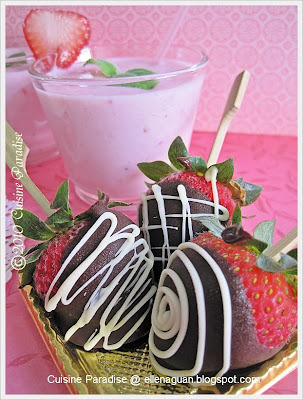 After our Berry Smoothies, let's have some Chocoberry to start off this afternoon high-tea. These are some easy to make and yet presentable sweet treats whereby you can impress your guest with different kind of decoration design. I am sure this will help you to score more points no matter your guests are Kids or Adults, they will definitely loves these. 2. Dry completely before you start dipping and make sure not a drop of water should be left on the berries. 3. Chop/break the dark chocolate bar into small pieces, put the chocolate pieces in a small microwave safe dish. 7. Put the dipped berries on some greaseproof paper and set them in the freezer for about 5 to 10 minutes before decorating it with the white chocolate. ~ If you are having difficulty holding the strawberry, skewer it just under the green bit with a toothpick just like what I have done in the photo shown above. ~ If you don't prefer white chocolate, you can used chopped nuts, shredded coconut, colour bits and etc to decorate your chocoberry. 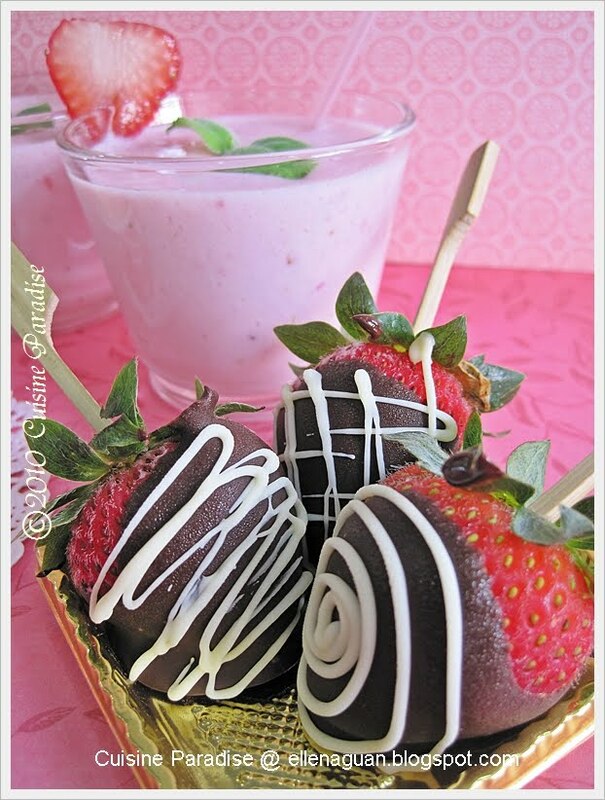 ~ These Chocoberry should be stored in the refrigerator and eaten at room temperature within 24 hours. For snack, we will be having this “Strawberry Cupcake” which is made from Strawberry Milk and freshly diced Strawberry. 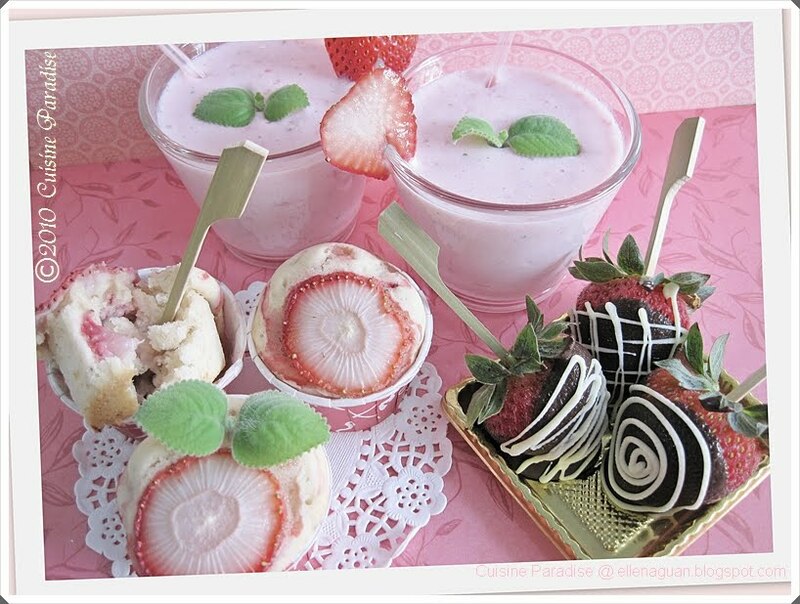 The texture of the cupcake will be slightly moist due to adding of fresh strawberry and when put it near your mouth; you will be able to smell that sweet and fragrance strawberry milk aroma in it. This simple recipe can bakes about 8 mini cupcakes within 30 minutes including the preparation and baking time. In this way, you can get everything ready and bake it just a few minutes before the guests arrive. I am sure they will be impressive by your little healthy “Strawberry Cupcake”. 1. Sieved the flour and baking powder together and set aside. 2. Use the electric beater, beat the egg and sugar till white and creamy. 3. Slowly add in the melted butter and continue to beat the mixture. 4. Next add in strawberry milk while the mixer still still beating, then gradually beat in the sieved flour mixture till well combined. 6. Spoon the mixture into the cupcake case till 3/4 full, top with a thin slice of strawberry and bake in a pre-heated 180 degree oven for about 15 minutes. 7. 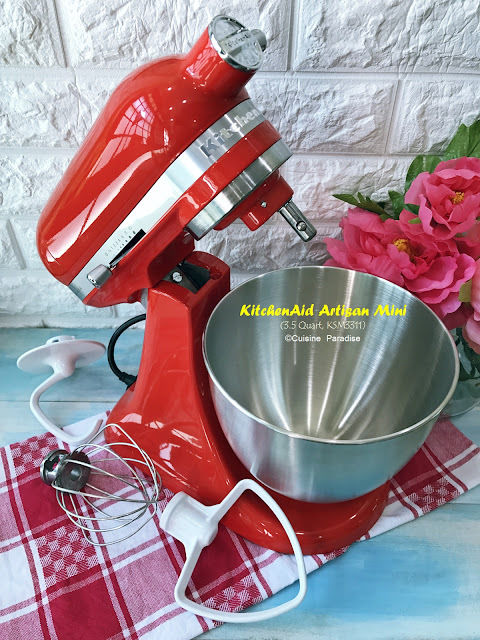 The surface of the cupcake will not be golden in colour so do not over baked it, test it with a skewer or toothpick check whether the center is cooked through. 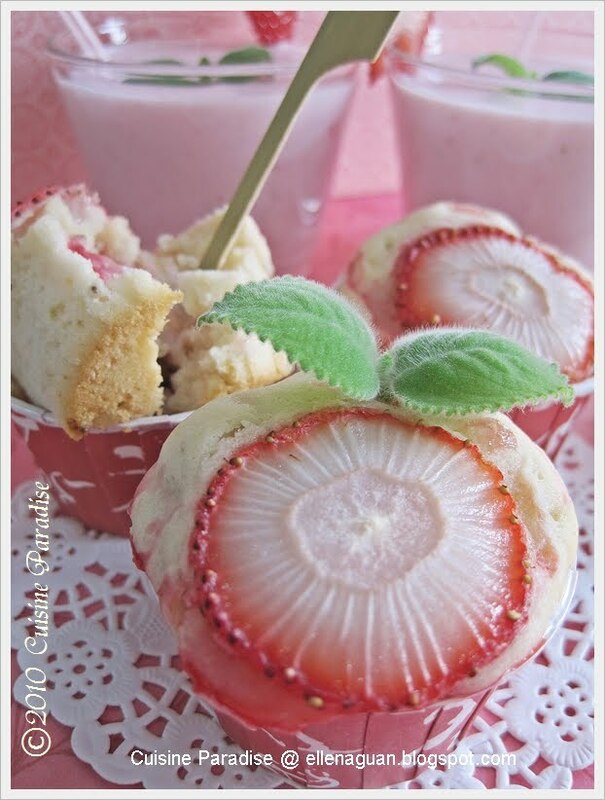 ~ You can replace Strawberry Milk with plain milk and 50g of butter with 50ml of corn/olive oil. ~ The texture of the cake will be slightly moist and the surface will be a bit sticky due to the adding of milk and fresh fruit. 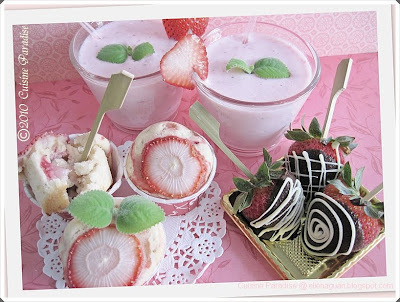 Since today’s theme is “PinkyBerry High-Tea”, all the items we have will be based on Pink/Strawberry. 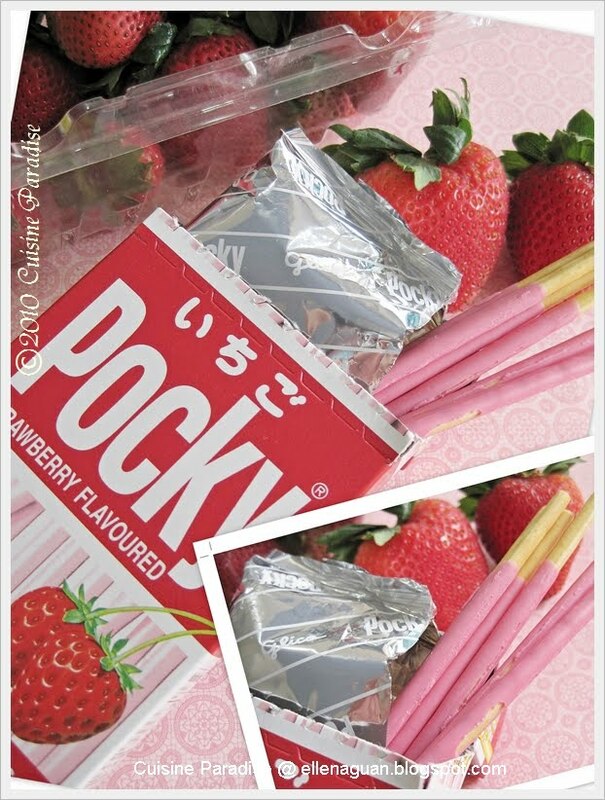 So after some light refreshment and snack, we can relax and let go ourself in some heart to heart conversation with a pack or two of "Strawberry Flavour Pocky" to spice up the some discussion topics. 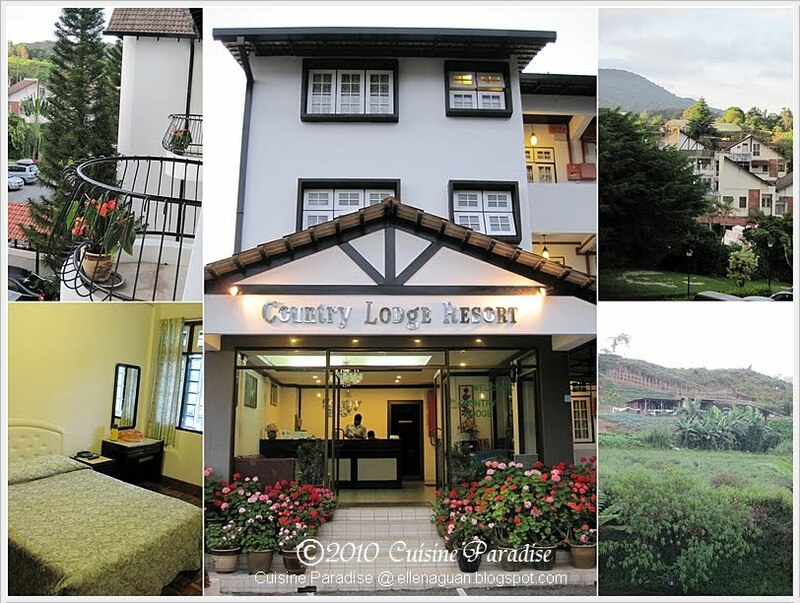 Talking about Cameron Highlands, what will be the first thing in your mind that you will think of? Is it their all year round cooling weather? Their well-known Strawberry Farms and Rose Gardens? Or even perhaps the Boh Tea Plantation in the high mountain area? But I am sure no matter what comes in your mind first; planning a trip over there is always another great sight-seeing venue for those who love the Nature compare to any shopping trips. Our journey starts pretty early in the Morning around 6.30am whereby we need to clear the Singapore Custom at Tuas as early as possible in order to avoid the morning traffic jam at the Malaysia Custom. After the custom clearance, we stop at a “big” coffee shop which is about 15 – 20 minutes away from the custom to have our morning breakfast. And according to Uncle James who works at one of the factory near that area, he was very familiar with that coffee shop stalls whereby he often go there for lunch break with his colleagues. So with his recommendation, most of us tried that “Ye Zi Mei Da Bao” which is quite similar to our local "Da Bao - 大包" which is big enough to be share by two people. 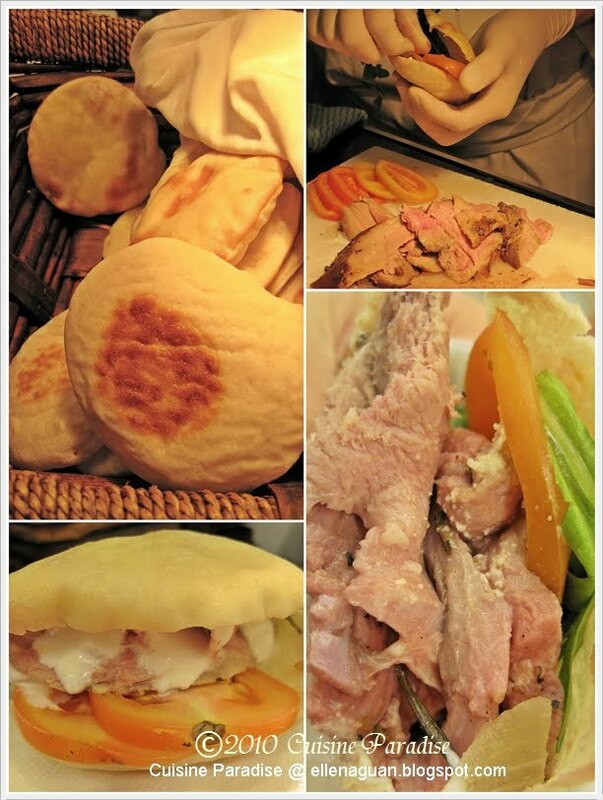 Personally I don't really like the taste, I find that there is quite strong flour taste with the bao skin. 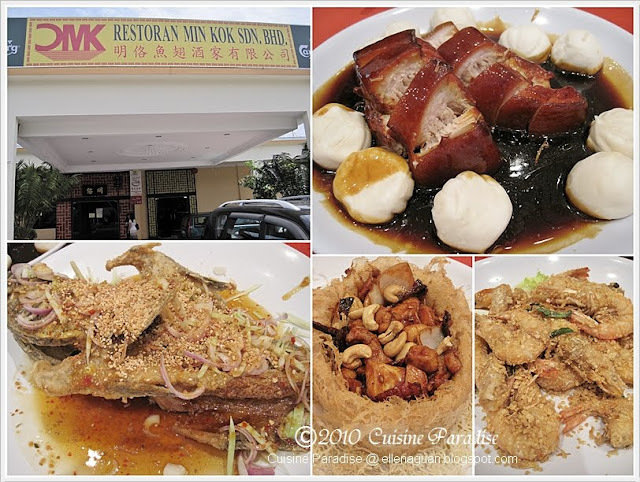 Like I have mention is my Taiwan trip previously, the best thing to look forward to when going for tour is nothing but eat and eat and eat :p After about 2 hours of travelling, we stop at a Chinese restaurant known as “Min Kok Restaurant - 明佫鱼翅酒楼” in Seremban - 芙蓉. 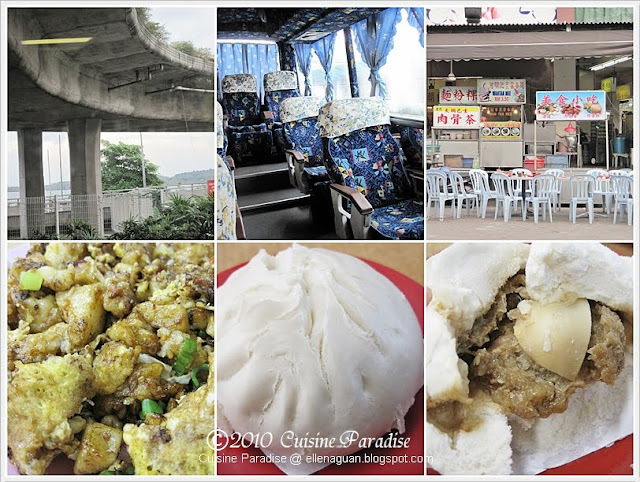 Accordingly to the local tour guide, this restaurant is famous for their dim sum because most of the people in Seremban love to eat dim sum for lunch instead of the usual rice and noodle. 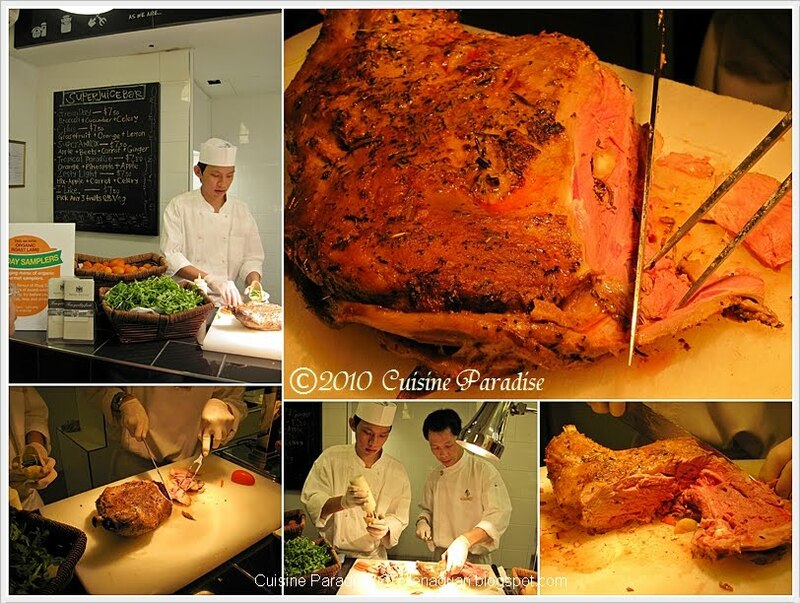 But for us, since we are on a tour group our lunch will be the usual 7 or 8 course meal instead of dim sum. Out of those dishes served, we prefer their “Deep-fried Fish with Thai Sweet & Sour Sauce” and “Braised Pig Trotter”. The Thai sweet and sour sauce goes very well with the crispy fish and also their braised trotter is so soft that it can melt in your mouth. Finally, we arrived at Cameron Highlands after surviving though all those winding curls along the road to the mountain. We reached “Country Lodge Resort” around 6.30pm in the evening and the weather was around 20 – 25 degree which is still manageable for most of us. 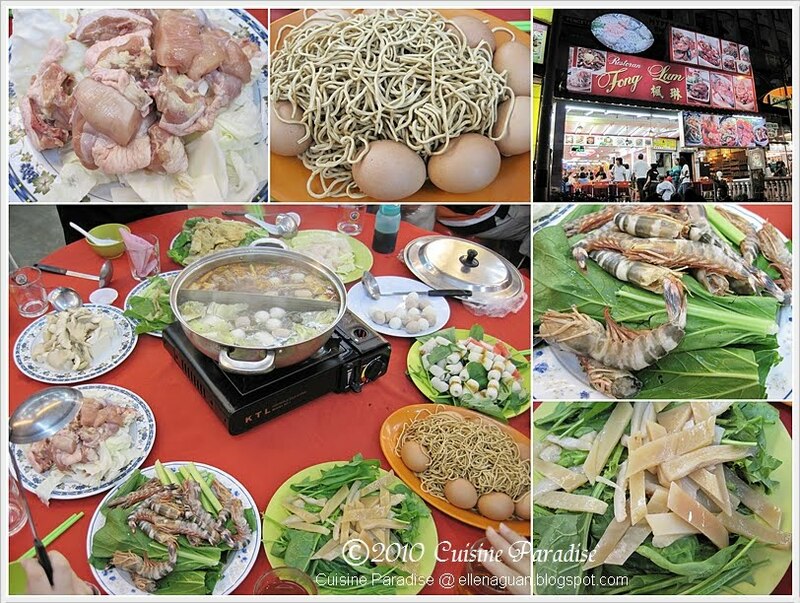 Dinner was served around 8:00pm at a steamboat restaurant that is 10 minutes walk away from our resort. All the food are arranged nicely on the table before we arrived and after we settle down with our drinks, the waiter starts to bring out the hot broth for us to get ready for our steamboat feast. 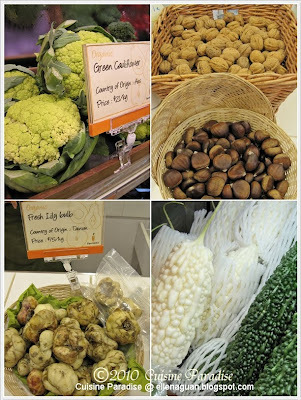 As you can see, there are so many fresh vegetables that are available for us to consume. 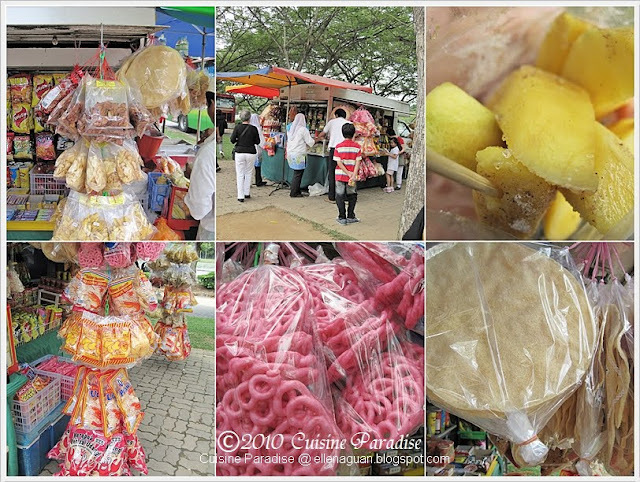 One of the top attractions in Cameron Highlands is their Brinchang Night Market or 'Pasar Malam'. This night market only operates on the weekends (Friday and Saturday nights) but during Malaysian school holidays, it operates every night starting from 6:00pm till 11:00pm. The Night Market cover relatively a size of at least half a football field, situated opposite Brinchang Police Station by the road side. 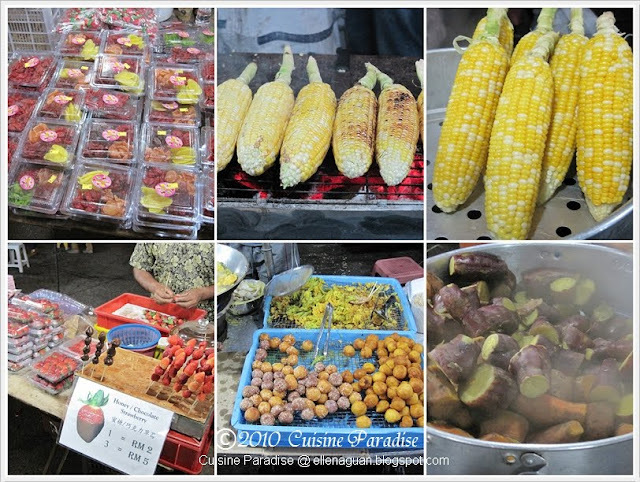 The Night Market consists of several sections such as Food Street, clothing stretch, vegetables, flowers, fruits corners, souvenirs and etc. Cameron Highlands seems to be the homeland for purple skin sweet potatoes. They are so soft and sweet which is best to eat while hot from the steamer. The “Pearl Corn - 珍珠玉米” appears alternating in yellow and white where you can buy it either “Steam” or “BBQ”, both are so tasty and juicy. 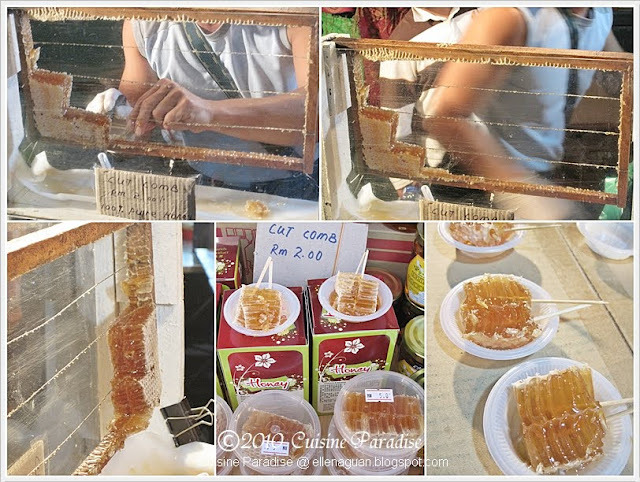 Along the stretch, we saw about 2 stalls selling this kind of fresh honey comb cube that is cut from the whole block of comb itself. These honey comb taste really sweet and yummy and it’s definitely a great experience to try one of this honey comb which we cannot possibly have it in Singapore. So next round when you visit Cameron Highlands, do give it a try @ RM$2.00 per piece. This interesting snack has caught my attention as it looks similar to our local Kueh Tutu. Over there at Cameron Highlands night market, there was only one stall selling these Putu Bambu. 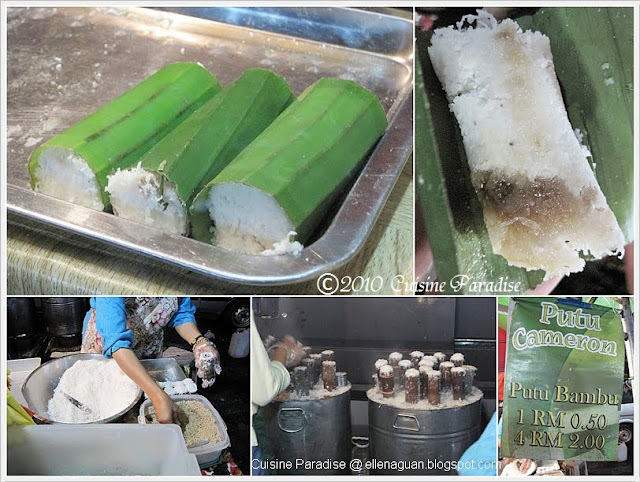 These snack are made from ground rice flour, fresh grated coconut and coconut palm sugar that were all stuffed into the bamboo tubes. Once they are steamed till cooked, the fillings will sink into the bamboo tube and each of them is then being pushed out from the bamboo tube and wrapped nicely with banana leaves. The taste of the Putu Bambu is so soft and fragrance and it costs RM 0.50 per piece. P/s: Stay tune for more @ 2nd post on the BOH Tea Plantation and Strawberry Farm...... coming up soon. "Wild Turtle House" located at Jalan Tampang, just opposite Sembawang Shopping Center. Due to the recent rainy weather, we hope to grab something comfort that might warm-up our body, so instead of their famous "Wild Turtle Soup"(which we don't dare to try by the thought of eating "turtle") we decided to try out their "Herbal Crocodile Soup - 砂煲药材鳄鱼汤". In this herbal soup, the chef used fresh Crocodile Meat instead of those dried type that you can find in most Chinese Medical Hall. Overall this soup taste great with it lightly herbal fragrant that cover up the "fishy" smell from the Crocodile Meat. Yam Rice - 芋头饭 is one of our "Teochew" signature rice whereby most of the Teochew housewife can whip up this dish in their own kitchen. But for modern working mum like most of us, unless is during weekends or our leisure time, I guess we won't be sweating in the kitchen just to prepare all these traditional food. If you are not picky about specify taste, the yam rice served here was rather good with it's ingredients and seasoning. Claypot Bak Kuet Teh - 肉骨茶 is one of the dish that is recommended by my 3rd aunty who is dinning there with her friend when we pop by the restaurant. 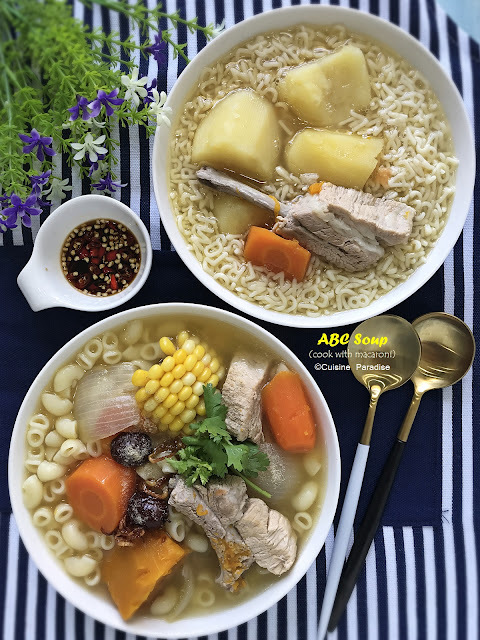 Although their Bak Kuet Teh does not taste fantastic compare to those famous stalls in Singapore, but they do have their homecook style standard that attract customers to order this dish. Stir-fry Chinese Spinach with Century Egg & Ikan Bilis - 江鱼仔苋菜 was quite similar to what my late father used to cook for us. But we find this vegetable dish was kind of overcooked and which overall makes it look kind of not appetising. Claypot Pork Liver - 焖猪干 is always one of my favourite dish since young and I can have two bowl of rice just to go with this dish alone. The Claypot Pork Liver served in this restaurant was those very homecook style and the pork liver are so tender to bite as it is not overcooked. Finally after a long wait, here comes their homemade Ngoh Hiang - 肉枣圆 which taste great with the sweet dipping sauce. The Ngoh Hiang served is cut into individual pieces then deep-fried till crispy on the outer layer but soft and juicy inside.